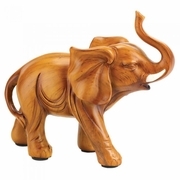 Small in stature but big on looks, this beautiful wood-look elephant is a winning addition to your decor. Polyresin. 6 3/8" x 2 5/8" x 5 1/8" high.